Konica Minolta DiMAGE Scan Elite 5400 II introduction : Konica Minolta Photo Imaging Inc. introduces the DiMAGE Scan Elite 5400 II film scanner to photo enthusiast and professionals. As the successor model to the Konica Minolta DiMAGE Scan Elite 5400 which was already popular because of its powerful 5400 dpi resolution, the Konica Minolta Scan Elite 5400 II further improves color reproduction with a new algorithm and delivers high speed scanning at a rate of 25 seconds per frame. The Konica Minolta Elite 5400 II combines all of the technologies that Konica Minolta has come to know as a manufacturer of film, cameras, scanners and photofinishing equipment. The Konica Minolta DiMAGE Scan Elite 5400 II not only offers 42.2 Megapixel resolution by adopting a high performance 5400 dpi 3-line color CCD, it improves color reproduction of negative film with a new Film Expert Algorithm developed with photofinishing technology. Without the hassle of manually adjusting, it can faithfully reproduce colours in images of the different exposure characteristics and color balance of various types of negative film. The Konica Minolta Scan Elite 5400 II delivers the quality demanded of photo enthusiast and professionals. With a 16-bit A/D conversion and a wide dynamic range of 4.8, the Konica Minolta DiMAGE Scan Elite 5400 II faithfully reproduces the rich variations in tone from light to dark of the original film image. Moreover, Multi-sample Scanning improves the scan data by reducing random noise. The Konica Minolta DiMAGE Scan Elite 5400 II incorporates a Quick Scan System that greatly increases work efficiency over earlier models. Owing to an improved drive mechanism, optimized internal processing and proprietary optics, the time required for setup, scanning and auto-focusing has been greatly reduced. These improvements increase the speed of earlier models two-fold to enable scanning at a rate of 25 seconds per frame. Moreover, the new film scanner features an Auto Loading Index that automatically begins index scanning the moment a film holder has been loaded. It also offers High Speed Preview that allows users to instantly display enlarged preview images without preview scanning. These features further shorten the total workflow by speeding up image selection and comparison. The new Konica Minolta DiMAGE Scan Elite 5400 II enables users to easily and accurately correct images, and thereby greatly improve work efficiency, by incorporating Digital ICE4, which offers detailed correction support, and Pixel Polish, which allows users to correct images according to characteristics of the scene. Digital ICE: automatically detects and corrects dust, scratches, fingerprints, mildew and other blemishes found on film. Digital ROC: uses advanced dye signature analysis to identify and restore faded colors on older film and slide images. Digital GEM: analyzes film emulsion patterns and reduces graininess while preserving image quality, color and sharpness. Digital SHO: optimizes contrast to reveal additional image detail in areas of deep shadow or extreme highlight. Pixel Polish: Pixel Polish optimizes brightness and color to suit scene, color and contrast of each image. 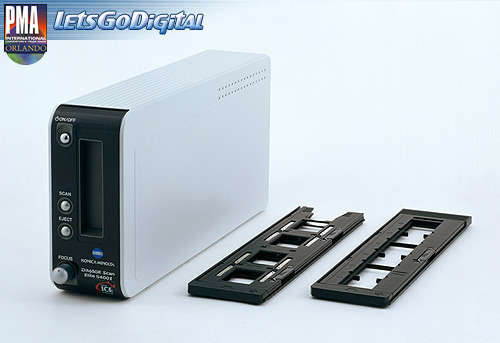 The Konica Minolta DiMAGE Scan Elite 5400 II is loaded with three types of driver applications in order support a wide range of users. Users can select a driver according to objective and purpose. The Easy Scan Utility is an easy 3-step on-screen-instructed procedure that beginners can use without worry. The Batch Scan Utility makes scan work more efficient by enabling continuous scanning at a user-set resolution, exposure and correction. The standard DiMAGE Scan Utility is great for creating works as it gives users the chance to set and correct images in detail. The new film scanner has a Quick Scan button and Manual Focus dial on the front panel to make scan work even easier and quicker. Simply pressing the Quick Scan button starts up the DiMAGE Scan Launcher where the user can easily select the driver applications for the job at hand. Moreover, workflow is shortened when settings have been changed because users need only to press a button to continuously scan six frames. The Manual Focus dial allows users to focus images as they desire.